An unofficial memorial to a village flooded 42 years ago to provide water for Liverpool has been repainted after being defaced. The landmark near Aberystwyth once again reads Cofiwch Dryweryn (Remember Tryweryn), but it had been altered to Angofiwch Dryweryn (Forget Tryweryn). The defacing upset some local people, who described the site in Ceredigion as a "national landmark". The wall was repainted overnight on Monday. The slogan was painted shortly after Tryweryn, near Bala, disappeared in 1966. Seventy people were forced to move from Welsh-speaking Capel Celyn in 1965 after nine years of angry protest. 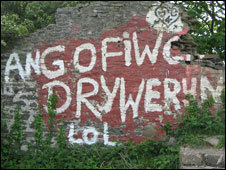 Hywel Griffiths, chairman of Cymdeithas yr Iaith Gymraeg (the Welsh Language Society), said he was pleased the wall had been repainted, but did not claim responsibility. On Monday, Glyn Davies, former chairman of Llanrhystud Community Council, the nearest village to the wall, said it was a "great shame" the landmark had been altered. 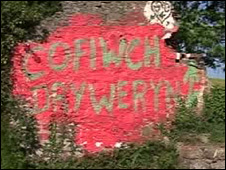 The wall has deteriorated over the years and there are plans by the Welsh Language Society to preserve it. It has approached Ceredigion AM Elin Jones and she in turn has contacted Wales' Culture Minister Rhodri Glyn Thomas. The historical monument agency Cadw has said previously that the wall did not qualify for grant aid because it was not a registered monument or a building of historical interest.